Mayo Clinic cardiologist Gurpreet Sandhu, M.D., Ph.D., is on a one-man mission to restore interest in American and Indian history by bringing World War II Jeeps back to life. By day, Gurpreet Sandhu, M.D., Ph.D., is a cardiologist at Mayo Clinic, working to repair and restore the hearts of his patients through his work as director of the Earl H. Wood Cardiac Catheterization Laboratory and chair of Mayo's Division of Interventional Cardiology in Rochester. At night and on weekends, you can find him working with another sort of patient — one made of rubber and steel. 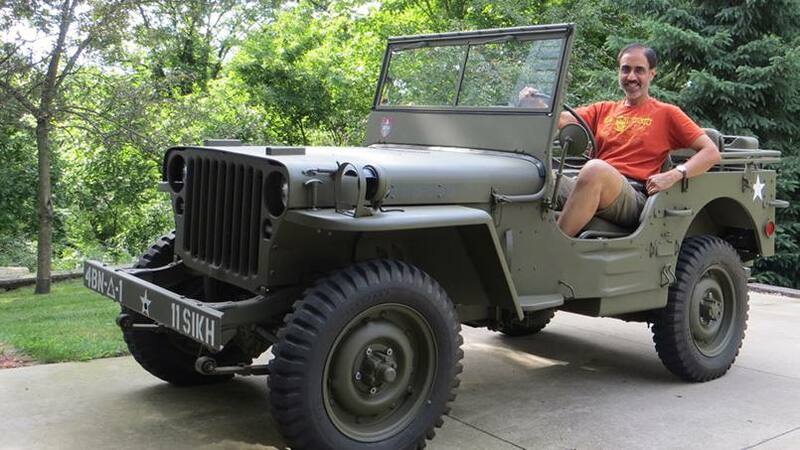 As Rochester's KTTC-TV and KAAL-TV report, Dr. Sandhu has devoted his spare time to finding rusty, run-down World War II Jeeps and lovingly bringing them back to life. It's a passion Dr. Sandhu tells us dates back to his childhood in India. His grandfather subscribed to Popular Mechanics magazine. "I started reading those and then just started tinkering with stuff," he says. He also brings the old Jeeps back to life to restore interest in the historical period they came from. "You can see Jeeps and remember the contributions of the soldiers," Dr. Sandhu tells KAAL-TV. Dr. Sandhu's grandfather, Randhir Sandhu, M.D., was born in British-ruled India in the late 1800s, and was shot in the chest while responding to Mahatma Gandhi's call for peaceful protests for independence. His injuries, thankfully, were not fatal, and he came to the United States soon afterward. After arriving in the United States, Dr. Randhir Sandhu earned a medical degree from the University of Kansas School of Medicine. He was later invited to Rochester as a visiting physician to learn from the practice of Drs. Will and Charlie Mayo — something Dr. Gurpreet Sandhu didn't find out himself until more recently. "I was in India on vacation around 1989, and he starts asking me if any of Will and Charlie's kids ever became doctors, or whether any of them were still working for Mayo Clinic,'" Dr. Sandhu says. "I said 'No,' not really thinking anything of it." His grandfather's next question was more pointed. "So then he says, 'What about Henry Plummer? He built that nice, big building … is that still in Rochester?' At that point I was like, 'OK … tell me more,'" Dr. Sandhu says. After returning to Rochester, Dr. Sandhu embarked on a mission to find evidence of his grandfather's time at Mayo Clinic. "I had no luck initially, but two decades later, a historian at Mayo was able to find his signature on a physician's log of Saint Marys Hospital dated June 3 and June 4, 1930," he says. "That was really impressive to me." And something that Dr. Gurpreet Sandhu tells us will continue to support his passion for restoring old military Jeeps. "I think we can use these Jeeps to spread awareness about the shared history and sacrifices made by so many countries, especially America and India, during the two World Wars," he says. Learn more about Dr. Sandhu's work to restore World War II Jeeps here and here. Then get in gear and leave us a comment below before you use the social media tools atop this page to share this story with others.